Good grief! What happened to my Iris nada? Well, the crape myrtle I’d planted years ago died, thrusting this partially shady area into hot afternoon sun. My iris got sunburned with this abrupt reversal. Other plants simply fried. I’ll cut off the bad leaves and move them to a shadier spot where they’ll recover nicely. The same thing happened to Marissa Garrett’s Agave americana: sun scald or sunburn. Daphne explains what happened this summer: “Even though this agave likes full sun, in 2015 we had a very unusual spring situation. It was cool, cloudy, and humid until early summer. Suddenly, we jump back into “normal” Texas weather with harsh, intense sun. Plants had no time to acclimate and toughen up to get ready. So plants that would not normally have any issues at all with extreme summer weather, like Marissa’s agave, are getting sunburned and drying out this year. But about cutting back agaves: I swell up dramatically when I run into a spiny end. Some people have intense reactions to the sap when dividing or cutting back agaves. Trisha shows off some of the other culprits that bother us most. If you’re allergic to latex, you may have issues with indoor schefflera and with figs when you remove the fruit (the greener the fruit, the more sap). Euphorbia sap can also be a problem, as with pencil cactus or poinsettias. Another is a common native euphorbia some gardeners consider weeds: Texas croton. I like it for the tiny flowers that attract tiny pollinators. Mine may be a one-seed croton. Alstroemeria can irritate, especially for florists who handle it a lot. By the way, Trisha says that we can grow this here! Other troublemakers from our viewers: okra, tomato and squash leaves, grasses, dandelions, Mustang grapes, lavender, comphrey, rue, zexmenia, lantana, bamboo (when cutting back) and even tumbleweed! Viewer pictures this week illustrate prickly cacti’s bonus along with structural beauty—gorgeous spring flowers. Thanks to Nancy Smith for this great shot by Russell Weir of Portland, Texas of a Texas Blind snake on a Horse Crippler cactus! And to Rose Polkowske for her gorgeous late spring blooming cactus flowers to attract lots of pollinators! This year, I faced a double whammy at home: the crape bed now super sunny and the front yard now too shady. To replace those that faltered with not enough sun, I’m considering Daphne’s Pick this week: Plum yew (Cephalotaxus harringtonia). This one in Lynne Dobson’s garden gets bits of early sun followed by shade. In Jeff Pavlat’s garden (our tour preview follows below), he combine cycads, dioons, coonties, and plum yew (to the right of the blue pot) in this shady spot. Here’s his nice combination: Mediterranean silver fan palm and plum yew. On The Garden Conservancy’s Austin Open Days tour on October 17, gather ideas for sun and shade. Charlotte Boyle joins Tom to preview diverse designs you’ll see this year. By the way, you may recognize Charlotte from her seasonal work at Barton Springs Nursery! Discover how to create destinations, magnify spaces, develop cozy corners, and captivate and control water. 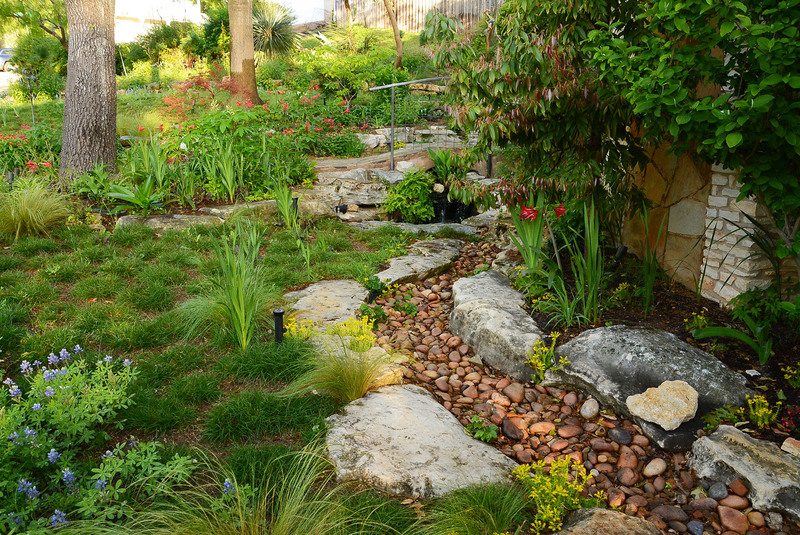 The McClurg garden: Sprout landscape architect Jackson Broussard—destinations and discovery. We’ve taped some of these but you’ve got to check out the changes since then! Helen Thompson and Charles Lohrmann garden: Kirwin Horticulture Services Patrick Kirwin—storm water control and old garden update. Landscape architect Christy Ten Eyck garden: water management for drought and floods in another total restoration. Deborah Hornickel garden: small yard boosted for serene, low-maintenance outdoor living with lots of new features. Visit two enchanting Scott Ogden designs on Windsor Road and Enfield Road, gently enclosed with lush and structural low-water plants, courtyards, and destination discoveries. Scott and Lauren Springer Ogden and Patrick Kirwin designed the revamped Rollingwood City Hall gardens, replacing grass with water saving structural attention and seasonal flamboyant color. Lauren will be on hand to answer your questions about how they did it. Here’s where you can get all the tour details, along with a chance to sign up for a very special conversation with landscape architect James deGrey David in his renowned garden. Since he and Gary have moved out of state, this is a rare opportunity to learn about their garden’s evolution. CTG headed out to tape one of the gardens on tour: Jeff Pavlat’s of the Austin Cactus and Succulent Society. We’ve taped it before, but wanted to capture it on HD! We were astouded yet again at how Jeff and Ray Clayton accept steep challenges with creativity and curiosity. When they bought a house on a rocky slope in deer country, they’d never built a retaining wall planter for succulents or a staircase patio from the ground up. They’d never even grown a succulent. Now, their multi-level garden is a standout showcase with low-water, low-care plants. It took them years, working in the evenings and on weekends, later joined by their young son to “help” mortar. Jeff always imagined a staircase to an upper patio. Director Ed Fuentes takes such care with every shot! Jeff turned an old millstone into a softly bubbling fountain, treasured by birds and other wildlife. On the back wall, Jeff arranged a stately trio of pedestals constructed with concrete tube forms. Now, the family has their choice of views: intimate connection to water or a view to the street. Or stretch back and enjoy the broad, bold connection. Stately Yucca rostratas form the gateway to a staircase leading to their son’s former playground. In beds near the greenhouse, Jeff beautifully clusters succulents, offset with accents, including an ocotillo trained to gain height while keeping its spreading style. Jeff tried it as a curiosity from a nursery who hacksawed it to about 18” to achieve that unique form. Now it’s one of his favorites. Once Jeff discovered the wide world of succulents, he couldn’t stop at cold-hardy specimens. With greenhouses, he cultivates plants from around the world. Here’s where he also germinates succulents from seed and harbors his propagations. Here’s Mark Morrow getting an eye-ful! Their first project was near the house, where they built an above-ground pond over a low spot. That’s just part of the story, so watch the whole adventure now!